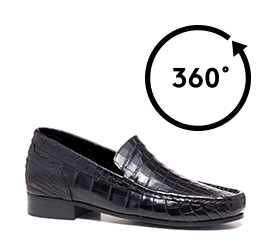 Luxurious elevator loafer made of 100% fine crocodile leather: a timeless classic entirely handmade by GuidoMaggi master shoemakers. The upper, thanks to the unique handcrafting, is extraordinarily soft and comfortable. The final result is a perfect fit for a refined and unmatched style. Entirely handcrafted using the finest materials such as the real leather outsole, and a meticulous sewing technique which gives a unique and distinctive design, extreme comfort and lastingness. An extremely luxurious height increasing shoe, accurately detailed which certainly won't let you go unnoticed.